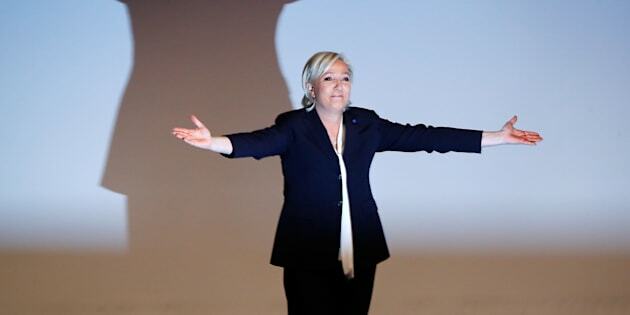 France's National Front leader Marine Le Pen gestures after her speech during a European far-right leaders meeting to discuss about the European Union, in Koblenz, Germany, January 21, 2017. KOBLENZ, Germany (Reuters) - French far-right leader Marine Le Pen urged European voters to follow the example of Americans and the British and “wake up” in 2017 at a meeting of far-rightleaders. Le Pen, head of the anti-EU, anti-immigrant National Front (FN) and seen by pollsters as highly likely to make a two-person runoff vote for the French presidency in May, has marked out Europe as a major plank in her programme. “The key factor that is going to set in course all the dominos of Europe is Brexit. A sovereign people chose ... to decide its destiny itself,” Le Pen said. “The second coup did not come long after: the election of Mr Trump to the presidency of the United States ... his position on Europe is clear: he does not support a system of oppression of peoples,” she added. In a joint interview with the Times of London and the German newspaper Bild published on Monday, Trump said the EU had become “a vehicle for Germany” and predicted that more EU member states would vote to leave the bloc as Britain did last June. The mood is mirrored in the United States, where Trump was inaugurated as U.S. president on Friday. Several leading German media have been barred from the Koblenz meeting, which is being organised by the Europe of Nations and Freedom (ENF), the smallest group in the European Parliament, in a year when the parties are hoping for electoral breakthroughs. Also at the meeting were Geert Wilders, leader of the Dutch far-right Freedom Party (PVV) who was last month convicted of discrimination against Moroccans, and Matteo Salvini of the NorthernLeague who wants to take Italy out of the euro. Protesters demonstrated outside the venue, with Sigmar Gabriel, the leader of Germany’s Social Democrats, junior partner in Chancellor Angela Merkel’s ruling coalition, due to join the protest.